To the outside world, it looks like Dismas Hardy is finally on top. A managing partner at his thriving, newly reorganized law firm, he’s a rainmaker and fix-it guy for clients leery of taking their chances in a courtroom. But what the world sees is a mirage. For beneath the surface bravado and the lucrative deal-making, Hardy has lost his faith in the law. Now Hardy’s young associate Amy Wu, suddenly rootless and grieving over the recent death of her father, brings the firm a high-profile and challenging case: Andrew Bartlett, the seventeen-year-old son of a prominent San Francisco family, has been arrested for the double slaying of his girlfriend and his English teacher. The D.A. wants to try him as an adult, but Wu cuts a deal to keep him in juvenile court—a deal that she’s forced to break. Overwhelmed by the mounting evidence against their client, and hoping to salvage his firm’s reputation in the face of the D.A.’s righteous wrath, Hardy sits second chair with Wu in Bartlett’s defense. As the Bartlett case moves swiftly to trial, Hardy is unable to turn to his old friend Abe Glitsky for help. Newly promoted to Deputy Chief of the Investigations Bureau, Glitsky has problems of his own when San Francisco is seized by a wave of violence. With fear and anxiety building, all eyes in the panicked city fix on an embattled Glitsky, who must somehow stop the criminal upsurge while being second-guessed and hounded by a hostile media. The city around them on the verge of panic, Hardy’s search for the truth takes him and Amy Wu down a path that becomes more perilous with each step. With very little belief in his young client’s innocence, and even less in the legal system, Hardy has to first conquer his own demons if he is to clear his client…and save himself. 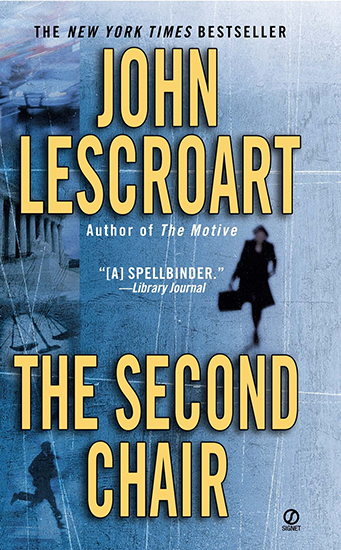 Emotionally powerful and exquisitely suspenseful, The Second Chair showcases John Lescroart as an author of ‘brilliant courtroom drama’ (The Washington Post), writing at the height of his powers.